Oklahoma teachers have confirmed they are still due to walk out of the classroom next Monday despite the state Senate voting last night on an emergency package to give them a pay raise. Oklahoma ranks 49th for teacher pay in the United States, with a starting wage of only $31,600. Educators are demanding a $10,000 pay raise over three years for teachers, $5,000 for custodians and other support personnel, as well as increased funding to pay for textbooks and school equipment. The state government has cut education spending by 28.2 percent since the financial crash of 2008—the biggest funding cuts in the country. It faces a teacher exodus, with many heading to neighboring states like Texas and Arkansas, or even further, for pay that is thousands of dollars higher. In 2017, about a quarter of teachers left the state or gave up the profession altogether. The teachers are fighting not just for their own salaries, but for boosts to the whole public education system. The deep cuts inflicted by the Republican-controlled legislature and Gov. Mary Fallin have left 20 percent of the schools in Oklahoma operating on just a four-day schedule. 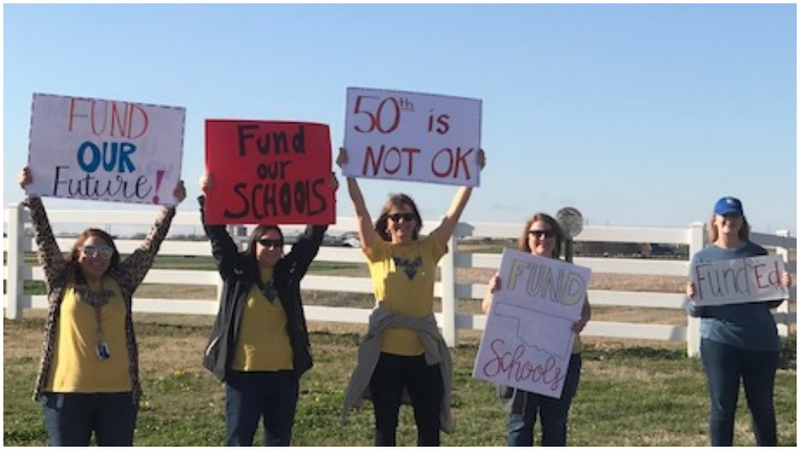 Inspired by the successful teachers’ strike in West Virginia earlier this month that won a five percent raise, the teachers in Oklahoma have for weeks been threatening a walkout if legislators fail to come up with a solution for their state’s education woes. They set a final deadline of April 2—next Monday—for the beginning of strike action. Late yesterday, the state Senate approved a bill passed by the lower house of the state legislature on Monday which would provide $450 million for raises for teachers and other state employees. Gov. Fallin said she intends to sign the bill. It would fund the hike through increased taxes on oil and gas production, cigarettes, fuel, and hotels, providing a raise of just over $6,000 each for teachers, who have not had a pay raise since 2007. The measure, though welcomed by union leaders as a step in the right direction, still accounts for less than the state lost in tax revenues when it slashed gross production taxes on oil from 7 percent to 2 per cent and on horizontal drilling for shale oil to just 1 percent during the fracking boom. “While this is major progress, this investment alone will not undo a decade of neglect,” Priest said. “Lawmakers have left funding on the table that could be used immediately to help Oklahoma students. Secondary school Spanish teacher and union activist Zachary Grimm said the package was “definitely lacking. “My teachers and I are still gearing up to walk out on Monday,” he said. This story features content from Morning Star, the Associated Press, and other services.